Remember the days when corporate IT departments looked at the iPhone as some kookie West Coast toy bound to mess up their networks? You know, when RIM – that is, BlackBerry – had a lock on big biz. Those days are definitely gone. Today, more than three out of four mobile phones in enterprises bear the Apple logo. What we’re seeing at the end of Q4 is roughly in line with that we’ve seen in the past, where iOS still commands a pretty significant share of activations of our customers. Good polled its more than 4,000 Fortune 100 companies on mobile device activation. By contrast, corporate use of Android devices fell to 22.7 percent, down from 29 percent during the fourth quarter of 2011. Even Microsoft’s Windows Phone – which can’t seem to buy good news – gained 0.5 percent of the enterprise market, placing it in “a distant third,” according to the report. While IDC also named the iPhone 5 the most popular mobile device in enterprise, in Good’s survey Apple’s mobile devices actually took the next four spots. 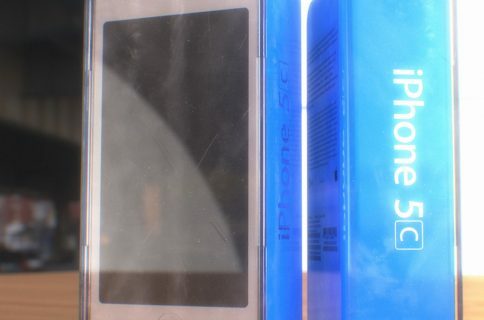 The iPhone 4S was the second-most activated device with 20 percent, followed by the iPhone 4, the iPad 3 and the iPad 2. If Android made any inroads into the corporate sector, it was through what Good described as “the rise of hybrid phone-tablet devices,” as Good put it. Realizing this, the South Korean conglomerate has been heavily advertising its mobile devices with SAFE technology that enables enterprise-grade security and feature enhancements, including advanced ActiveSync capabilities, VPN connectivity, on-device AES 256-bit encryption and more. Once again, Samsung is closely-linked to Android advances, this time its Galaxy Note being credited for Google’s share of the corporate market reaching 6.8 percent of activations, up from 2.7 percent in 2011. In one of those apples versus oranges comparisons, Good said Android smartphone adoptions grew at a faster pace within corporations than the iPad during October – finishing 2012 just behind the Apple tablet. 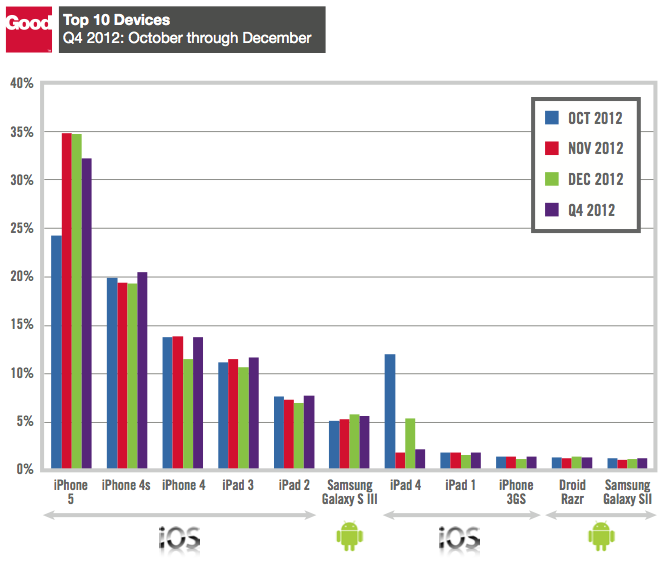 Samsung again saved Android’s bacon, the Galaxy S III becoming the most-activated Android device for corporate customers. 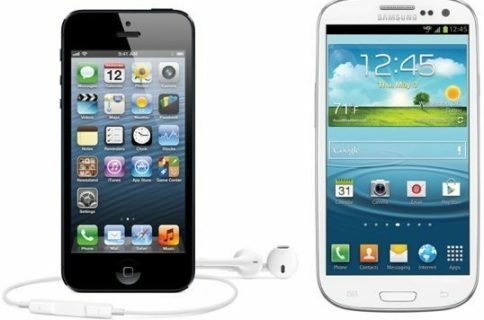 But can Android continue this trend, perhaps accelerated by the upcoming release of Samsung’s Galaxy S IV, up for an announcement at the March 14 Unpacked event in New York? Don’t bet on it, Good suggests. “Not any one Android model is going to have as significant an impact as the iPhone,” Herrerna said. By the way, The Wall Street Journal spun this survey as bad news for Apple, but Daring Fireball‘s John Gruber exposed the paper’s sensationalism.